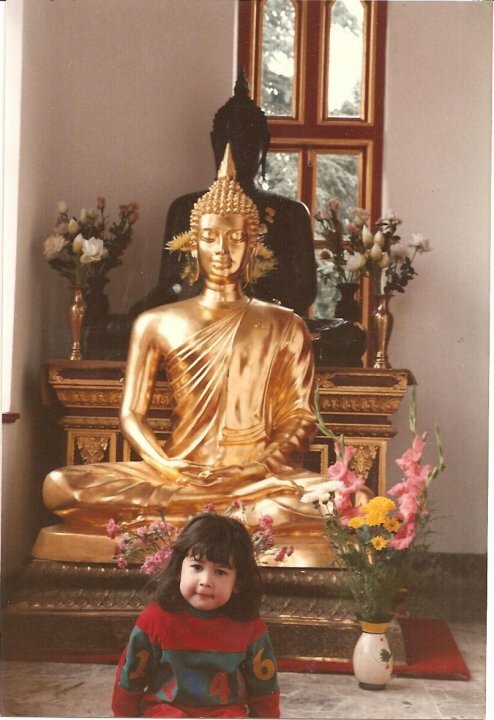 I was at a Thai temple in Thailand when this photo was taken and about three-years-old, so circa 1985. 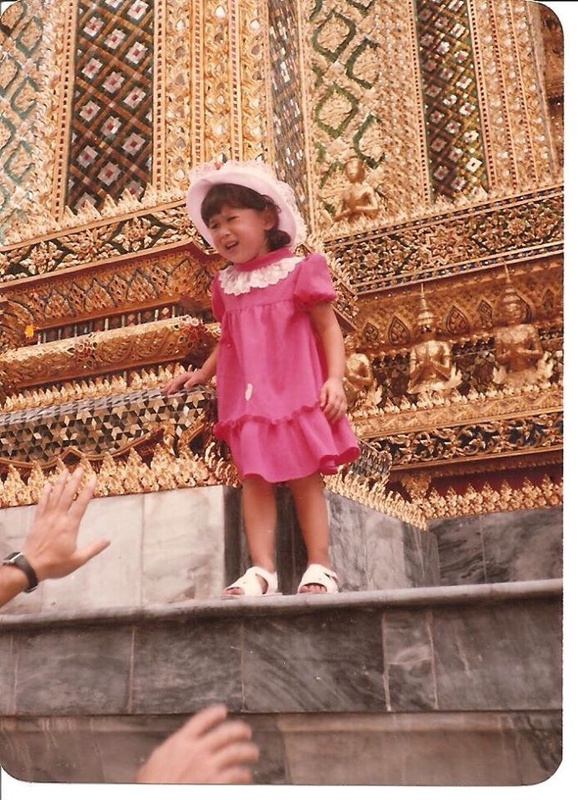 I think it was the Grand Palace in Bangkok and my uncle wanted me to pose for a picture but I was afraid to be up off the ground. Those are his hands just in shot! Growing up with a Thai mother and relatives has meant that I have always been to temples and to many Buddhist ceremonies. Songkarn (Thai New Year), Loi Krathong (a festival that celebrates light, it involves making decorations which can float on the river) and Wan Dek (Children’s Day) are probably my most enjoyable as a child. I am pictured here in the Uposotha Hall at the Thai Temple in Wimbledon. I wouldn’t say I was particularly religious but I like the idea of a higher power who looks after me, my family and friends. As I mentioned in my post about Chinese New Year, our family and friends believe that if you ask the monk in this hall for a wish, as long as it is reasonable, i.e. you don’t ask to win the lottery or to live forever, that it is usually fulfilled. I asked the monk for Andy to get a new job closer to home as his commute is currently an hour per journey. Guess what? He has been offered a new job which is 30 minutes from home! One of the suggested offerings for the monk if your wish comes true is 99 hard boiled eggs. It sounds very bizarre but apparently those are the terms! Let me know if you like my Throwback Thursdays or if you have asked for a wish and it has come true. So nice to hear that the wish came true! If I were to pay the temple a visit and request for a wish, I’d wish to be a successful writer with my stories inspiring others and making them happy (cheesy, I know…). As a kid, my parents took me to Chinese/Buddhist temples once or twice a year, usually around the Lunar New Year. I was always given joss sticks and instructed to give them as offerings to the higher powers above us. That’s a nice thing to wish for. 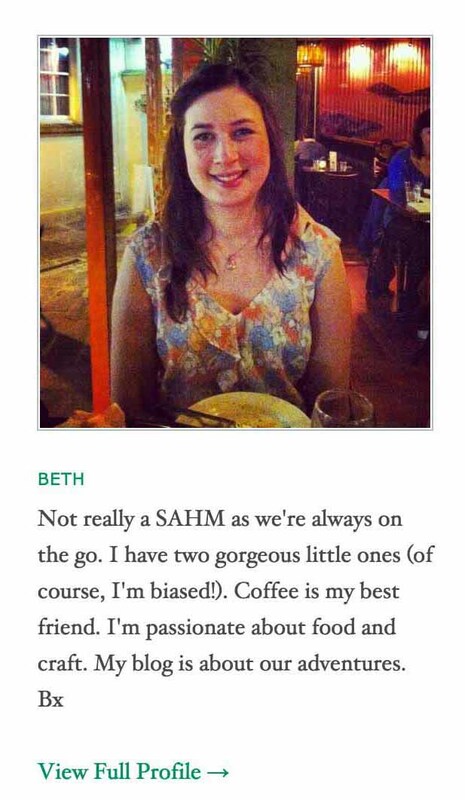 Not cheesy at all. I hope you have much success. My mum said she had been to the temple many times to pray Andy got a new job but our wish only came true after a friend told us to offer the eggs. Such a bizarre thing.